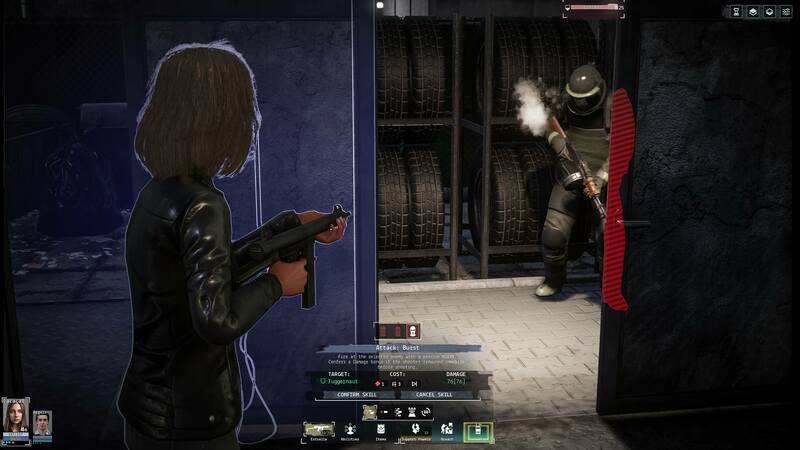 Set in an alternate history take on the Cold War, Phantom Doctrine sees players leading the fight back against an international conspiracy which is attempting to gain control of the world through clandestine operations and carefully placed agents and assets. You’d be excused for thinking, on first impression, that Phantom Doctrine is simply a poor man’s XCOM with a Cold War setting. There are, however, many things which set the two apart. They should make the game a lucrative offering, even for those who prefer laser rifles to a martini. I was lucky enough to spend some time with the upcoming game while I was at Gamescom earlier in the year. CreativeForge (Ancient Space, Hard West) were showing off an early —but definitely functional— version of the game in the booth of freshly rebranded publisher Good Shepherd. Combat was already in, as was the strategic map and a lot of curious operations elements, which I’ll probably be talking about the most in this piece. Much like in its influences, and the studio’s previous efforts, you’re massively outnumbered, However, as the aim of the game is to discover and unearth the enemies’ location — and their cells are very active, moving around the globe between missions, focusing and learning as they go — the real commodity comes in the acquisition and deployment of intelligence: in the distribution of tact, the positioning of your agents, the preparation ahead of your missions and, most importantly, the military and espionage use of the term. Due to the clandestine nature of the enemy they’re hidden around the map at most points in time, embedded into agencies or stripping out assets under the players’ noses. The best way to counter this is to extend your web of agents and informants, however if you extend too much you’ll become a much larger target for the opponent. Being vastly more powerful, and ice cold, they’ll strip you clean of agents in rapid strikes. While the game features no traditional fail states, it’s hard to recover from having to relocate your centre of operations or having your agents turned against you — and they will be. Here’s where the game gets interesting: both factions have a variety of tools at their disposal for extracting information or repurposing agents. For a start, some agents may simply turn or become willing double agents. Alternatively, as it’s an international matter, some less ethical methods may be deployed. Torture and planting trackers are options, however you may instead install a Manchurian Drill. The Manchurian Drill, for those who aren’t aware of The Manchurian Candidate, clears memories of a subject’s capture and works as a form of deep hypnosis — the subject will return to the enemy and go about their mission, but at any time (and at your command) they can be flipped to your side. If they’re on a mission then you’ve gained a new field agent right there; if they’re operating at base then you’ve almost certainly just gained a mass of critical information. It’s extremely unethical, but perhaps more daunting is the fact that the enemy are willing to do it too, as they have the same toolset as the player. When you’ve grown attached to your agent, even sent them to be pumped up with strange chemical cocktails and had their face changed to keep their profile low, then they flip… well, that’s got to hurt. Field missions come in a variety of forms, although most can be boiled down to infiltration or assault. With ample preparation you can install an agent undercover at a location or set up snipers and support agents. Control of this is entirely up to the player — if you find out about a site which could contain critical information then you might decide to storm it guns blazing, while others send a solo agent undercover as an office worker. You can also, as was shown to me during my time with the game, do a bit of both. The developer led two assault troops, with silenced weapons and full armour, through a two storey office building, while an undercover agent deactivated security and electronics ahead of them. Things got tense as armed guards controlled a central office containing the objective: a locked safe. However, the team’s sniper — an off-screen resource, but still a deployed agent — fired off a shot, taking out an awkwardly placed enemy. Following that, the dev had two units sync their movements and actions into a single ‘breach’ wherein they cleared a room which had been spotted by an off-screen agent. The two agents moved in together, neutralising both targets and securing the room. The objective was in hand. The objective, in this case, was a few pieces of paper, meaningless without context. Take them back to the base, however, and they play a major part in what is without a doubt my favourite part of the game. Phantom Doctrine’s story is different each time you play, as each of the bases and agent selections are generated on new game start. 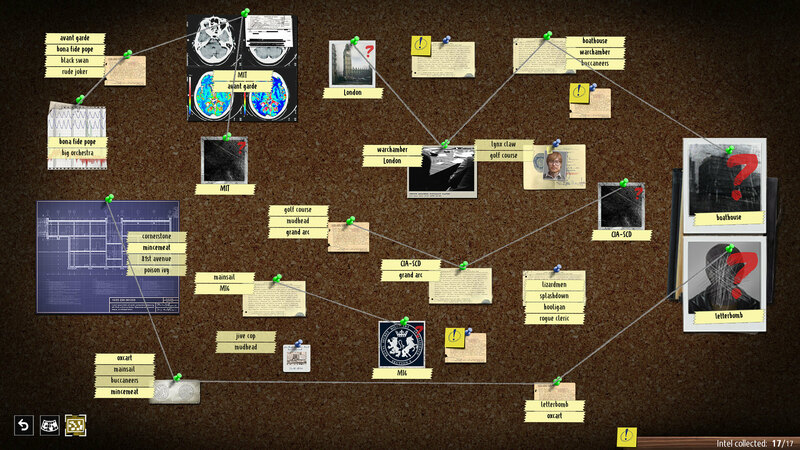 Those names, codenames and locations are then strung together into a system which creates a selection of clues. It’s these clues which you piece together from intel, pinning them to a cork-board like they do in detective films and games, the player drawing connections between locations and agents to hone in on where the group operates from. It’s absolutely charming and it also scales to game difficulty — the developer showed me the board in various complexities, from ten pieces of information on the board to over twenty-five. Back to the mission at hand. Everything had gone swimmingly, but the developer decided to show what happens when it doesn’t — deliberately popping the case without deactivating the alarm. The three friendly agents summoned an escape vehicle and a timer appeared. A very tight timer. Enemies were almost immediately on site and an assault helicopter was summoned. Things were not good. This, kids, is why we don’t take on worldwide conspiracies face-to-face. At this point, the pace utterly flipped. 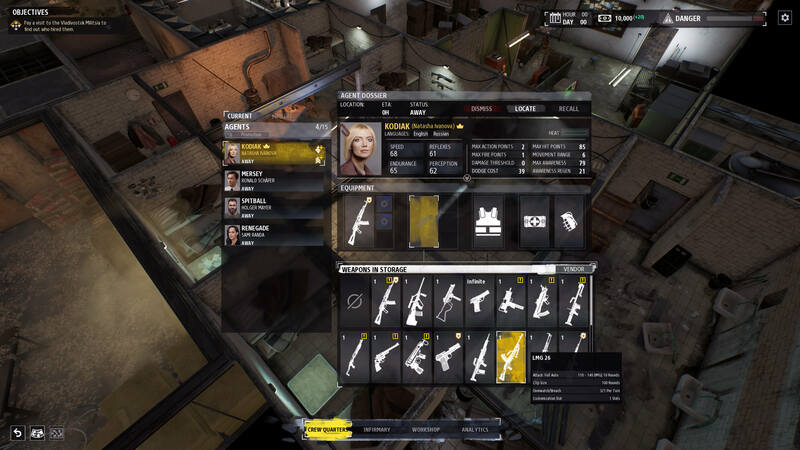 While Phantom Doctrine includes cover, it was hardly relevant as the developer had the freedom, line of sight, and immunity as an undercover agent to spot as they moved forward. With the alarm sounding, however, and enemies closing in, everything became a rush. A slow, steady pace or spotting ahead of time is out — the new cool is getting out of there fast and loud, getting to extraction before bad news arrives. 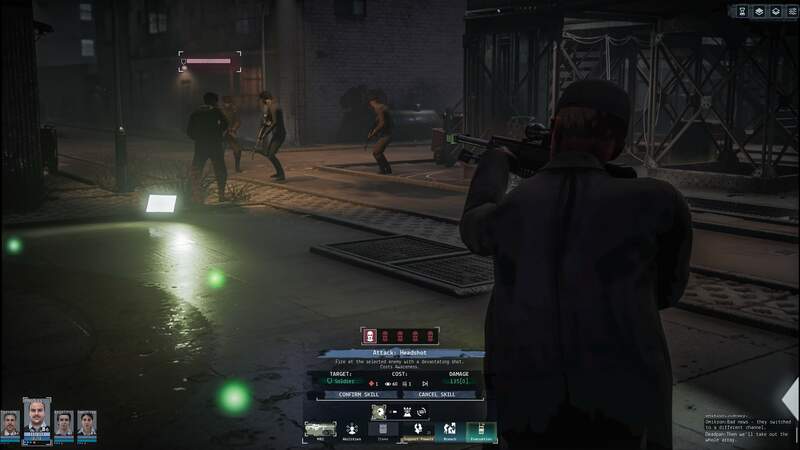 But first, another thing which Phantom Doctrine does very differently is the way attacks and combat work. Everything is pretty much a guaranteed hit, assuming you are within range and line of sight. This ensures that undercover and assault agents have an advantage over unsuspecting enemies at the start of combat — allowing coup de graces, long-range take-downs and the previously mentioned breaches to go off without a hitch. Obviously, there needs to be a mechanism in place to give people a chance when fired upon, as fun as a room of people locked in a massive standoff would be. This is where composure comes into play. It’s very much spy-movie plot armour: the ability to flinch, dodge and bob out of the way of a bullet in the nick of time. That said, once your composure is gone you’re almost certainly down and out within a shot or two. Returning once more to the mission and the arrival of bad news, an enemy gunship lines up to strafe the map every second turn, with the turn before giving you an indication of where they’re about to hit with the next missile salvo. This makes a loud extraction dangerous, risky, and thrilling. 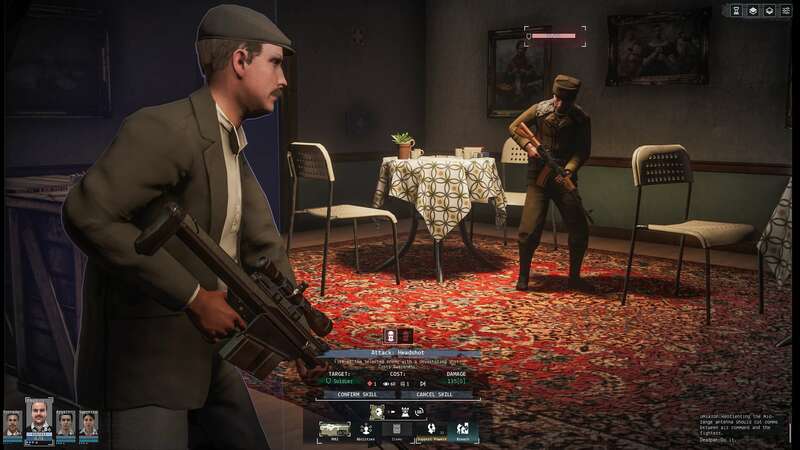 At launch, Phantom Doctrine will contain three starting points: KGB counter-intelligence, CIA commando and a third which will be locked behind story completion. Regardless of your start, each game will be different due to the generation of enemy agents and missions. Each campaign was estimated by the showcasing developer to weigh in at around forty hours — although fans of the genre will know that such estimates are rarely accurate, and the actual time is normally reliant on how invested players are in their tactics. A game where the enemy can — and will — deploy the same subterfuge as you is a curious one. Especially when there’s always a chance that your perfectly planned mission can take a turn for the worst when a few agents you didn’t fully check over turn out to be counter agents. They drop their former colleagues, leaving them crippled, captured or terminated. 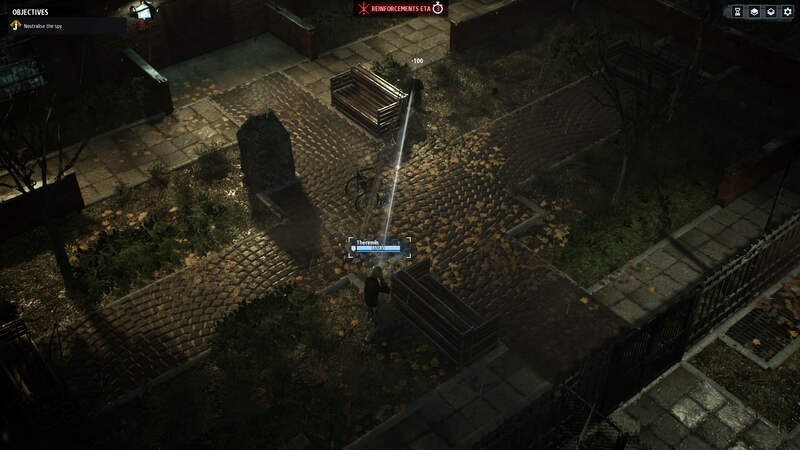 Phantom Doctrine is, undeniably, one to watch.